In Santos Limited v BNP Paribas  QCA 11, the Supreme Court of Queensland Court of Appeal has held that a letter of demand for $55 million under a bank guarantee was invalid because Santos failed to execute the letter of demand in accordance with the prescribed form. The decision serves as an important reminder that the validity of legal communications can depend on minor and technical matters, particularly if they are connected to the purpose for which the instrument is issued. We recommend that legal communications relating to an instrument (eg. a bank guarantee) strictly comply with any prescribed form or wording requirements to ensure validity of those legal communications and enforceability of the instrument. The dispute involved a letter of demand sent by Santos Limited (Santos) to BNP Paribas, requesting payment under a bank guarantee for $55 million issued by BNP Paribas (on behalf of Fluor Corporation) in favour of Santos (the Bank Guarantee). The Bank Guarantee stipulated that BNP Paribas was obliged to pay $55 million to Santos if BNP Paribas received a letter of demand “in the form of the letter attached to this Bank Guarantee (amended as applicable) purporting to be signed by an authorised representative of the Beneficiary”. In the draft form letter annexed to the Bank Guarantee, the words “Authorised signatory of Santos Limited” appeared below the sender’s signature (see Item 1 below). Santos issued a letter of demand for an amount of $55 million. The letter of demand was signed by Santos’ General Manager of Development, Mr Simpson. The company’s name and Mr Simpson’s position appeared below his signature (see Item 2 below). However, the words “Authorised signatory of Santos Limited” were not included. Santos subsequently requested payment of $55 million from BNP Paribas, who refused to pay on the grounds that the letter of demand did not comply with the form of the draft letter annexed to the Bank Guarantee. 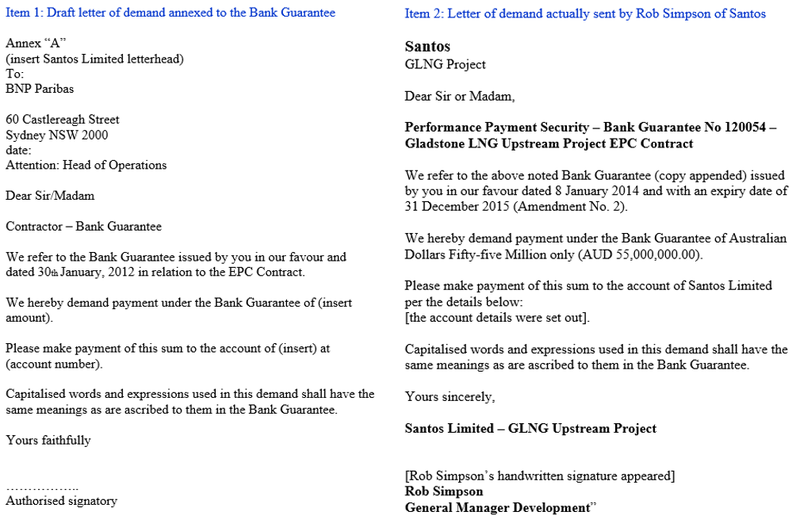 Santos could not issue a new letter of demand because the Bank Guarantee had expired. The trial judge held that the letter of demand sent by Mr Simpson did not trigger BNP Paribas’ obligation to pay Santos $55 million under the Bank Guarantee. The Court of Appeal upheld the trial judge’s decision and dismissed Santos’ claim (see Court’s reasoning below). The Court of Appeal endorsed the trial judge’s reasoning, focusing on the commercial purpose(s) of instruments such as bank guarantees as interpreted from the perspective/standard of a reasonable business person. Importantly, it was noted that there was nothing at law that explicitly requires any particular form of execution of a commercial instrument. However, the words “in the form of the letter attached…purporting to be signed by an authorised representative of the Beneficiary” which were included in the Bank Guarantee had to be strictly followed. The Court of Appeal held that these words “relieves the issuer of the necessity to look beyond whether the party making the demand has met the stipulations of the bank guarantee”. This, coupled with the fact that a bank guarantee is considered “as good as cash”, meant that the Court considered an explicit representation of the sender’s authority was necessary to uphold the purpose of the Bank Guarantee. Specifically, a clear representation of authority was an “essential feature” for any letter of demand under the Bank Guarantee (as opposed to potential non-essential elements, e.g. use of “Yours faithfully” rather than “Yours sincerely”). The Court of Appeal concluded that there was no clear representation that Mr Simpson was an authorised representative of Santos for the purposes of executing a letter of demand under the Bank Guarantee, even though: (i) the letter was issued on Santos’ letterhead; (ii) “Santos Limited” appeared above Mr Simpson’s signature; and (iii) Mr Simpson’s position was clearly stated. The Court reasoned that the above “merely indicated that he held a particular position in the company and said nothing as to his authority in that role. The letter of demand contained no statement of his authority to sign on Santos Limited’s behalf”. While the exact words “Authorised signatory of” did not need to be explicitly stated for the letter of demand to have been valid, Mr Simpson’s authority had to be clearly manifested.